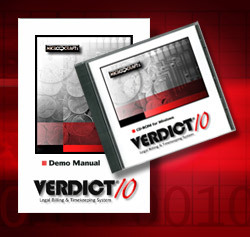 Experience the power of Verdict 10 first hand by ordering your free Demo Disk and Overview. Available on CD-ROM, this easy-to-install demo will give you all the capability of the real program. The demo is limited to 300 total entries, but all other functions are fully supported. Call 256/830-9746 or E-mail us today to request your own free copy.